Apple has come to Vancouver, joining H&M this week by opening a store at Pacific Centre. 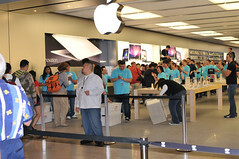 Devoted Apple fans started to line up for the opening as early as 5:30am on Saturday. When we arrived just before 9am, the line extended all the way from the store inside the mall to the outdoor of the mall. By 10am, the time of the opening, the line was wrapped all the way around the block. 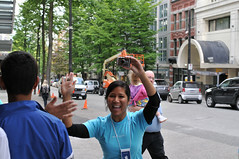 A half an hour before the store opened, a crew of highly-energized Apple employees came out to cheer on the crowd. At 10am, the doors opened to applause and hundreds of eager people filed in for their free Apple shirts and a look at the new store. The store is deceptively large – it seems small, but is actually quite big. It’s filled with row upon row of Apple gadgets I’d love to buy!